I am always interested to receive feedback from people who attend one of my talks, workshops or holidays. The following represents a selection of the comments I have received which specifically relate to my Wolves Workshop. I run this this unique workshop in conjunction with the UK Wolf Conservation Trust at their centre near Reading the only place in the UK where you can see Arctic, European and North American wolves at one location. The centre is normally only open to members but because I am supporting their education programme I can offer these very special workshops at a very reasonable rates. The keepers lay special food trails to tempt the wolves into the best positions for us and using special areas and holes cut into the fence we have the opportunity to get up close and photograph some truly awe-inspiring animals in fantastic settings. 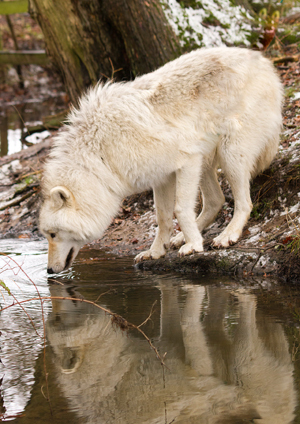 The wolves are housed in 4 large landscaped enclosures providing excellent opportunities for natural images. By special arrangement we take some of the wolves for a “walk” over open farmland and though woodland. This provides unique opportunities to take great photographs in a range of different habitats including the wolves wading in, and drinking from, a stream and a small pond. Feed back received from attendees of the Wolf Photo Workshop. "Fantastic workshop, Interesting briefing on the wolves and their history before hand, and what body language to look out for, plenty of on hand help with photography during the day."